A mural of Lesandro "Junior" Guzman Feliz in front of the bodega on Bathgate Avenue in the Belmont neighborhood of the Bronx. A ceremony with his parents and city officials on Wednesday, February 27, 2019 co-named the street in his honor. The street where Lesandro “Junior” Guzman-Feliz was killed last summer in an act of gang violence will now be co-named for him. 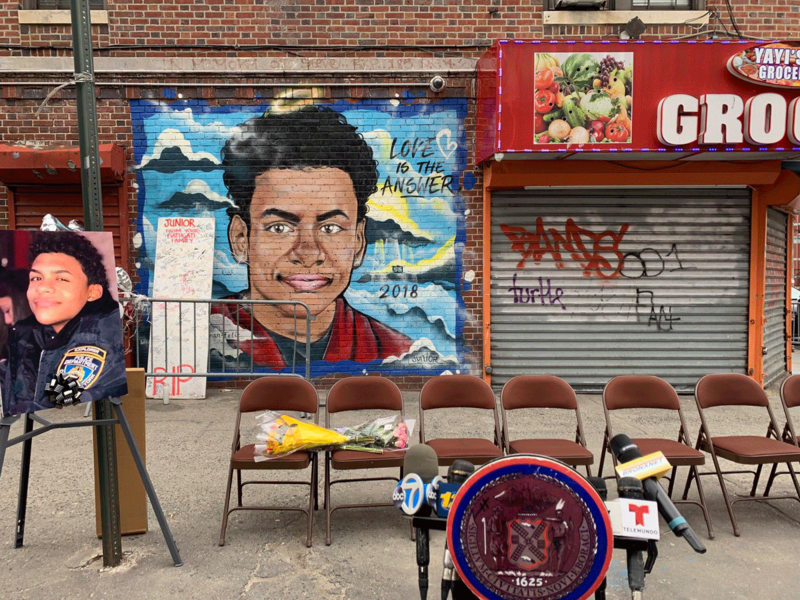 Friends, family and neighbors gathered Wednesday, to honor Junior’s legacy with a new sign reading “Lesandro Junior Guzman-Feliz Way.” After Guzman-Feliz was killed, the hashtag #justiceforjunior went viral and video of his brutal murder circulated online. Bronx Borough President Ruben Diaz Jr. also addressed the community members. He started in Spanish before continuing in English. “Whenever we do these co-naming ceremonies it’s usually for someone who lived a long, fruitful life,” he said. “Someone who did extraordinary things that we want to commemorate. “The fact is, I wish that we did not have to be here this morning. I don’t want to be here. I wish that we didn’t have to do this. Junior’s light was dimmed way too soon.” Diaz Jr. also talked about working with schools, clubs and violence interrupters to prevent a similar event to Guzman-Feliz’s death from ever happening again. “While we have mourned and we continue to mourn and support the family now let us all make sure that he did not die in vain. That his name will live on forever,” Diaz said. Junior’s parents were given copies of the new street signs to take home. As part of WFUV’s Gang Impact series, in collaboration with Bronxnet and Norwood news, WFUV reporters covered the NYPD’s gang database and a PI’s quest to take down the Trinitario gang. WFUV's Mia Tommins also contributed to this story.